Live edge tables are experiencing a sort of Renaissance. You've probably seen one and wondered what it was. 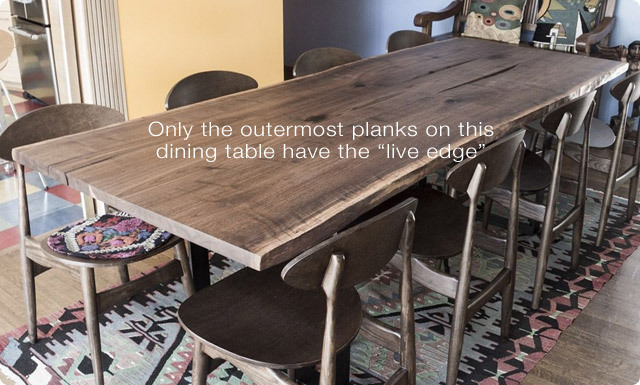 So what is a live edge dining table? How is it made? Why are you seeing them everywhere? And are they really that cool? Don't worry; we've got answers for you! "Live edge" refers to a process of using wood, generally in furniture or shelving, where at least one side is left untouched or natural. Here's some items with "live edges:"
The above image is oversimplified for illustration purposes, but you can see the trunk on the left yields 40 2" x 4"s with 20-25% waste. The same trunk cut for live edge products yields eight single live edge slabs that might be used on a joined top (discussed below) and eight solid slab live edge planks (in the middle with the "live edge" on both sides), leaving just 5-8% waste. If it's not apparent, live edge products are typically considered more environmentally friendly because more (if not all) of the wood is actually used. In a sense each tree goes further. Furthermore, it's very common for live edge furniture to be crafted from a felled tree or tree branch, or other reclaimed source. Although there's no hard and fast rule, a majority of live edge found in the US is Walnut or Oak. There are pros and cons to this style of live edge. Obviously, it's pretty rough - you don't want to bump your shins on that! And if it's not apparent, every table has to be handmade from start to finish to preserve the natural shape, and leave the bark unharmed. 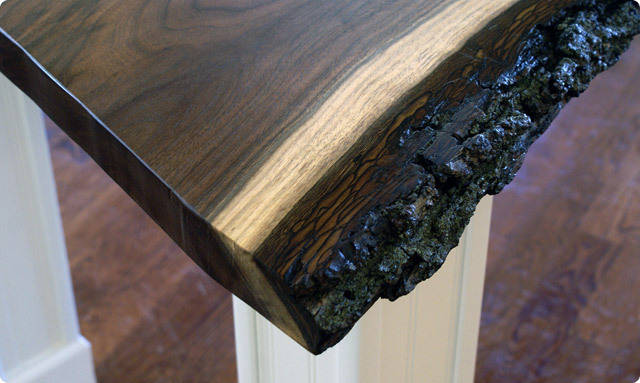 On the other hand, when done properly, the full-on (bark on) tables like this are truly stunning. They bring a natural element into your space that can't be matched by other materials. Furthermore, because of the skill and craftsmanship required, they're very rare! Even Paul Bunyan and Babe are impressed by live edge furniture. Either way, bark on or off, the table surface is oiled and dried and then shellacked. Typically, bark-on live edge gets a few extra coats of shellac to ensure the bark itself is properly sealed, and won't break or crack off in the future. 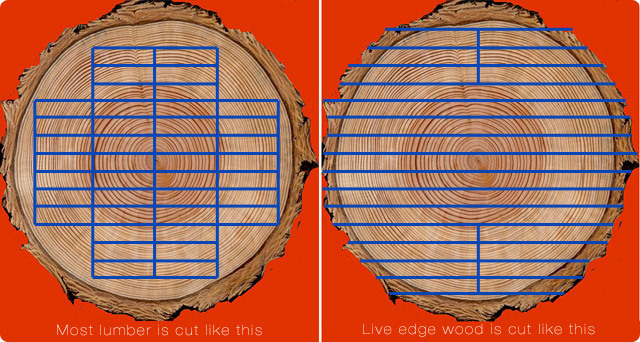 The main factor that determines price on a live edge table is how the top is made. 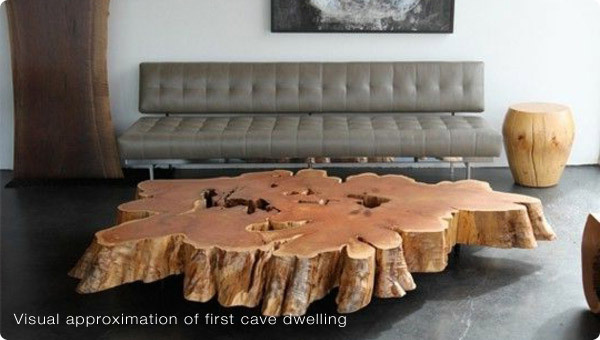 A solid slab top (one piece of wood) has to come from a single, very large tree. 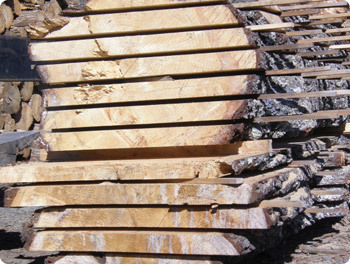 The top is cross-sawn from a single whole trunk as shown above. Obviously, rarity is a factor here. A standard dining table is 36-40" wide. If you picture the tree that's 40" wide, and tall and straight enough from which to cut a large, flat top, and you can start to see why solid slab tops are difficult to come by, much less produce en masse. Solid slab tops also require significantly more of the construction to be done by hand. Due to their size, they don't fit into most planers (the machines that make wood flat), so a solid slab top has to be hand-planed and then sanded down with a drum sander. Both of these processes are time and energy intensive! A notable exception here is wall shelves, mantles and console tables. Because you're usually only dealing with 10-16" of depth on these items, they do fit into standard planers, and are usually more affordable and much easier to find. Obviously, there's a huge range depending on table size, but a standard solid slab live edge dining table is usually between $4,000 and $12,000. The more affordable alternate to solid slab is a tabletop constructed from multiple joined pieces of wood with live edge pieces on each side of the slab. A vast majority of wooden dining tables are constructed this way anyway, with multiple pieces of wood that are joined with hardware, biscuits, etc., and then planed to create one large flat surface. 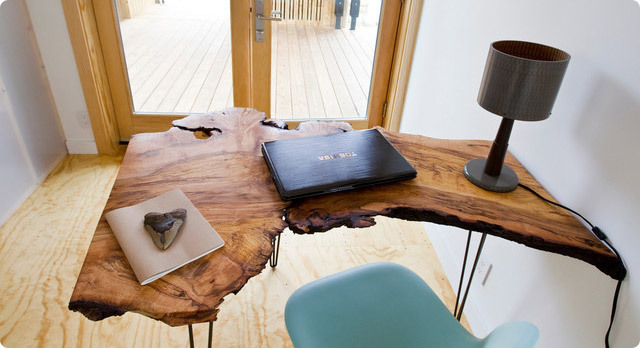 So, in many ways, a live edge table is very similar to a standard wood dining table. The notable exception is that the outermost wooden planks are also the outermost parts of a tree, and they have to be hand finished before being joined to their typical lumber brethren! Generally, you can find a joined live edge dining table starting around $2,500 up to $6,000. Where Did the Live Edge Design Come From? Live edge furniture was originally popular in mid-Century modern homes, most notably by architect George Nakashima, who crafted a series for Knoll in 1946. Like many designers and architects of his era, Nakashima was a strong proponent of integrating natural, organic elements into his designs. Think Fallingwater, for example, and you can understand why Nakashima deliberately chose wood that was imperfect - burrs, knots, you name it - and then tied the beauty of nature, flaws and all, into his designs. Is That Why It's So Popular Now? Of course, we'd be remiss to forget one additional point here. An added benefit to live edge tables is that they're not specifically modern or contemporary. Yes, obviously, they fit in well into those motifs, and they're popular selections with interior designers. Nevertheless, live edge adoption isn't limited to just the segment of society that trends towards modern. Live edge is raw wood, in a very real sense, so it's also quite popular in more traditional settings. Picture a ski lodge or cabin, for example, and you catch our drift. Okay, But Are They Really That Cool? In a word, maybe. Design is obviously highly personal, so the style won't appeal to everyone. If you're into mid-Century classics, then the odds are good that a live edge table will appeal to you. Ellen has one... right?!? On the other hand, if you're of the Monica Gellar school of thought, we suggest steering clear of live edge. As we mentioned, live edge wood blends well with a myriad style choices, so its versatility is a plus. On our end, we love that every live edge table is completely unique. In many ways, you can consider them works of art. Pulling in a little bit of nature really helps sooth modernism's harder edges. If you're leaning towards purchasing a solid slab dining table, your best bet is to find a local craftsman to custom build it. There's a good chance you can hand-select the wood, and be a little more involved in some of the design decisions that go into creating a live edge table. Because each slab is unique, it's not uncommon for knots and imperfections in the wood to create some choices. For example, a particularly gnarly knot might compromise the strength of the surface, and you and your craftsman will need to decide to keep it as-is, reinforce it, or sacrifice that section of wood. A 21st Century alternative is to check out online marketplaces specializing in custom made items. A good place to start is CustomMade. Arhaus also has a good variety of options. If you already have plans for a base, and you're on the hunt for just the slab, you might consider Marwood. Here in Austin, I had a tough time fining a local source! If you're considering the more budget-conscious joined tops, you've still got the option of finding a local woodworker. A skilled carpenter could add the "edges" you love to a more traditional joined top at a fraction of the price of a solid slab. Given that production of live edge tables necessarily involves a good amount of woodwork by hand, there's still not a ton of retail options. 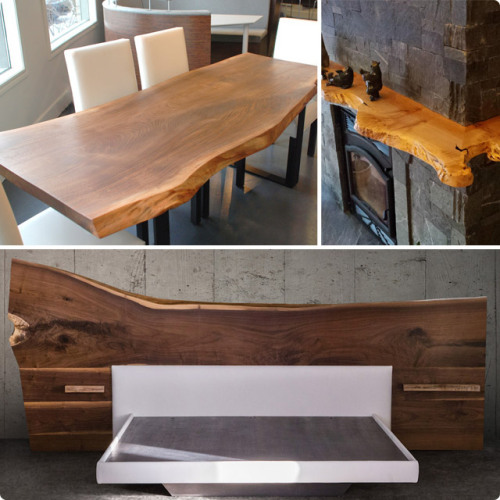 We carry a cool selection of contemporary and modern live edge dining tables here. We also found a retailer offering more traditional styles here. Only you know if live edge is for you. If you know that's the direction you want to go, and you understand the varieties and options, finding a live edge table is like finding the right piece of art: It takes time and patience, and is completely worth it! Have more questions about live edge tables? Feel free to call us at 855.663.3447 or e-mail us!